But it shouldn’t really be this way. History isn’t just something totally disconnected to us; it isn’t just the story of dead glorious people. “History is who we are and why we are the way we are” said David McCullough. History is the search for the truth of important or every day people, of epic battles and of life during peace times. It should be interesting. It should cause people’s eyes to sparkle with excitement, ask questions and discuss with each other. 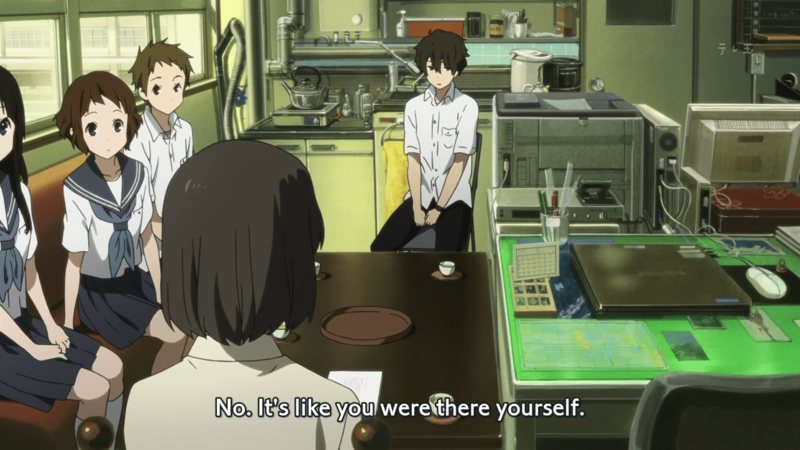 Much like in Hyouka. Because these kids were conducting historical research on a small scale. 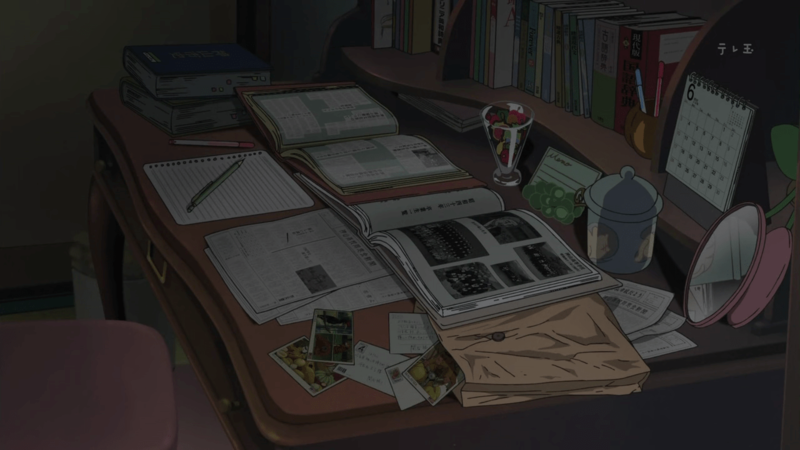 What we see in episodes 4 and 5 of Hyouka are historians at work and the perspective of the new historiography. In contrast to the Old History, which focused on the narrative and considered the sources to provide the truth in raw form, New History emphasizes analysis and interpretation, and supports a critical approach towards the source material. The latter also is concerned not only with big narratives (national history) but also with smaller narratives (local history), such as Kamiyama’s school festival incident. According to the Annales School, a style of historiography developed by French historians in the 20th century, history should be studied in 3 layers: structures, conjunctures and events. Braudel, who suggested this framework, wanted to show that time moves at different speeds and one can say that he divides time into geographical (long span), social (medium span) and individual (short span) times respectively. Structures exist in the long span, and they may last hundreds, even thousands of years. They refer to the underlying social patterns which provide continuous constraints on our actions. They may represent patterned cultural, economic or political modes of reacting to natural phenomena or perceiving social realities. 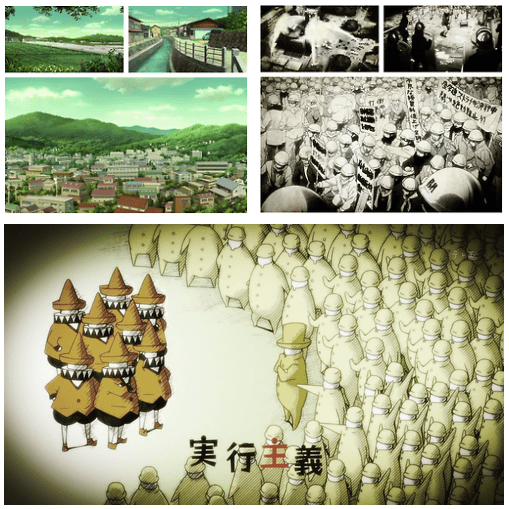 We can see in the series that Kamiyama, in Gifu prefecture, is surrounded by green, that farming is still taking place, and that the families who have big parts of land, like Chitanda’s, possess a pretty high social status. It would be safe to assume that these characteristics were pretty much the same 45 years ago and the mentalities accompanying rural areas are also maintained. Structures don‘t make an appearance during this first arc of the series and don’t seem to play a significant role to the solution to the mystery, yet are still there. What we do get to see in episode 4 is the presence of conjunctures. Conjunctures lie between structures and events and represent the cyclical rhythms within the normal fluctuations of all structures. A conjuncture in our story might be the ‘uprising’ against authority, in particular the government and secondarily the teachers. Yes, the student movement of the 60s that Fukube mentions first and their hypotheses up till that point take a whole other meaning. 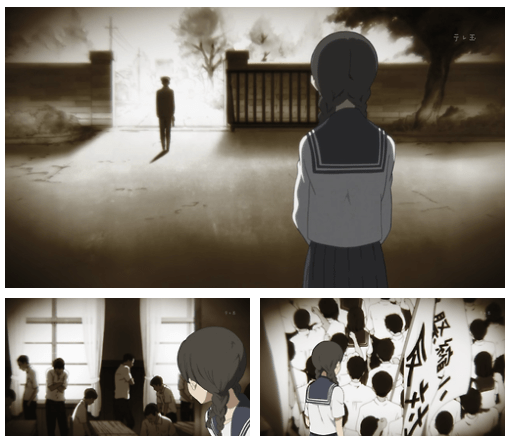 The event of course is what happened to Kamiyama High School 45 years ago, and to be more precise, the past of the Classic Literature Club and the past of Sekitani Jun. So how do historians seek the truth? The answer is by following certain steps. First of all, they search for available sources, keeping in mind the topic of interest at all times. They categorize and evaluate the sources and choose those that are considered more valid. As students, the available sources for a very specific topic can be limited, but more than one source is always important in order to do cross examination. 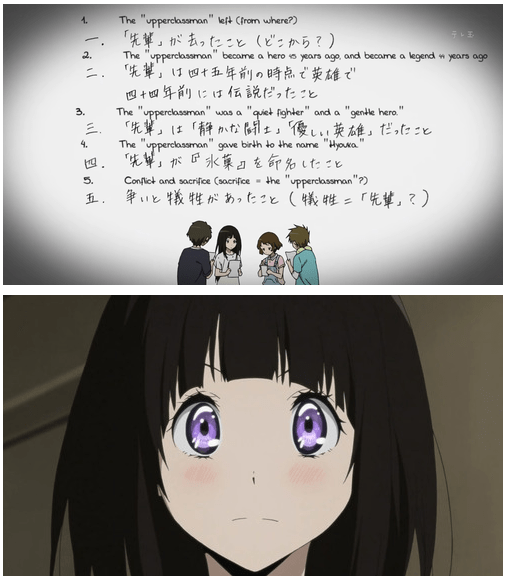 Chitanda focused on Hyouka’s anthology vol.2 introduction note, Ibara searched the library and found Unity and Triumph vol.1, Fukube dug up the archives of the Wall Newspaper Club’s Monthly Report, and Oreki sought some official records and brought information from Kamiyama High’s 50 Years of Journey. All of them are primary sources. Then comes the analysis stage. The texts are carefully read, the important facts are singled out, keywords and thematic of each text are highlighted and the first hypotheses are formed. By going through more texts, facts are added, doubted or confirmed and the hypotheses are corrected. And most importantly: questions are asked. When: June 1967. Cultural Festival Discussion Meeting. Conflict. / October 1967. Sekitani’s Jun expulsion. 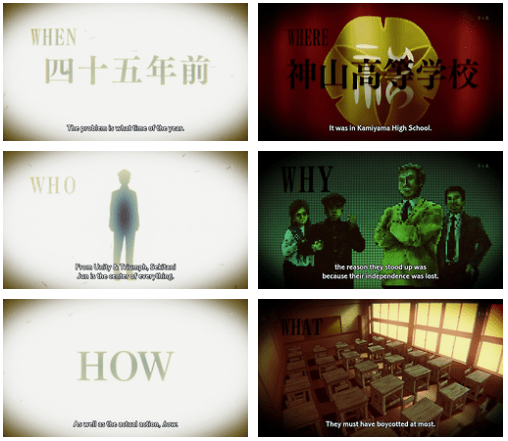 Who: Sekitani Jun and the student body. Why: Students’ independence was forfeited. Questions though towards the source and the ‘story’ would be just inadequate and pointless without activating ‘filters’ and setting in motion our critical thinking. While analyzing the text, the researcher also asks who wrote each source, to whom and for what purpose. This phase is kind of omitted, but Fukube does make a remark on Ibara’s text, since it seems prejudiced in favor of revolutionists. The feelings and the intention of the author might distort the truth and mislead the researcher. Critical thinking entails among other things the ability to fill in the gaps using logic and previous knowledge from outside the sources. 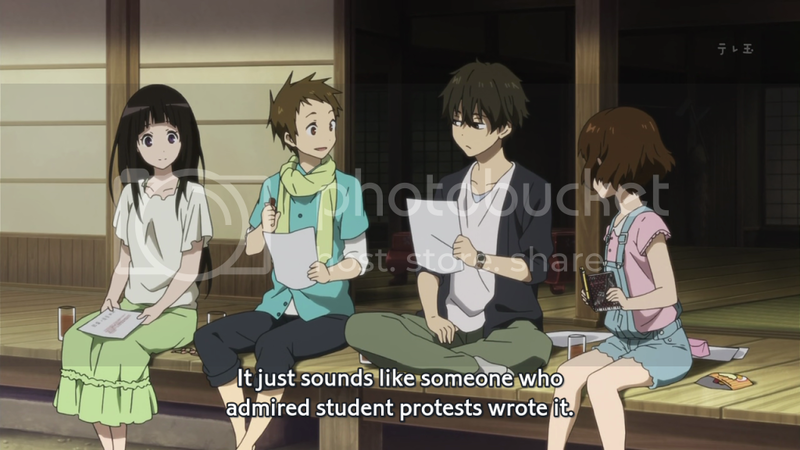 For example, Oreki corrects Ibara when she claims that the revolution was violent, because if we talked about a punitive act, Sekitani Jun would be expelled immediately and not five months later. Reading between the lines and comprehending/clarifying ambiguity is crucial, too. Do you remember when Ibara pointed out that the ‘legendary protest’ and Sekitani Jun’s incident are one and the same—otherwise there would be a visible distinction? That’s making use of linguistic rules. 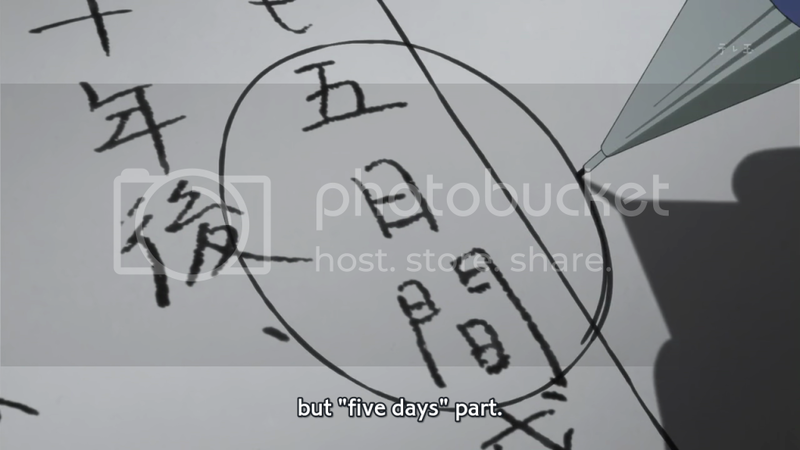 Similar are the cases of the puns/homonyms/heterographs discussed among the four characters (sacrifice-offering, Kanya-Sekitani, hyouka= ice cream-I scream). And of course we shouldn’t forget empathy. In the historical context, the concept of empathy is much more than just seeing a person, idea or situation through the eyes of another, but rather is a much deeper understanding of the circumstances and concepts surrounding the event. In other words, empathy is ‘wearing one’s shoes’ and reconstructing a situation/an era. 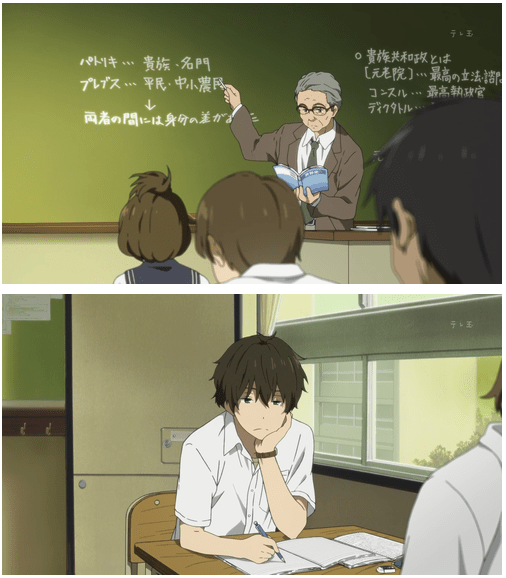 Oreki seems to excel in it. If there are still holes in the conclusion, the researcher might need to revise his/her sources or search for more. Texts aren’t the only type of sources available. Paintings, artifacts, clothing, even buildings are considered sources of equal value. 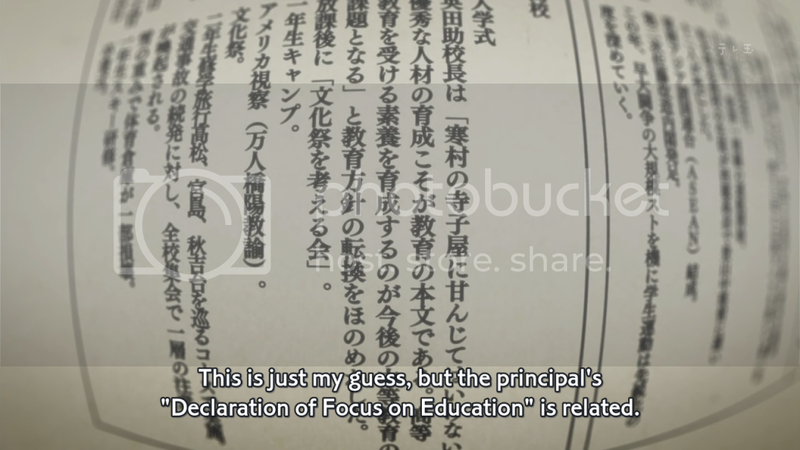 Hyouka’s cover is a very good example that was unfortunately mentioned in the afterward of the conclusion. Its symbolism could be easily decoded and supplement or testify for the theory they’ve formed. 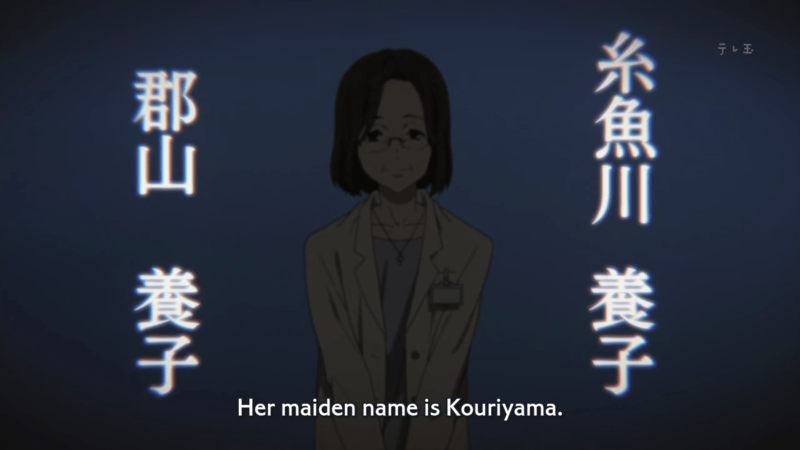 The niece of time arc ends with an interview with an eyewitness, namely Ms. Koriyama Youko, the librarian. As shown finding an eyewitness can be elusive, especially when it comes to women who drop their maiden name after marriage. Usually it is even more elusive— they had great ‘luck’ that she was still around town, and moreover working in the school from which she graduated. Eyewitnesses are valuable, but they can only present their point of view, which isn’t always sufficient when someone tries to approach the truth as objectively as possible. @The Paper: I’m happy that I managed to get my point through :) History is misunderstood. 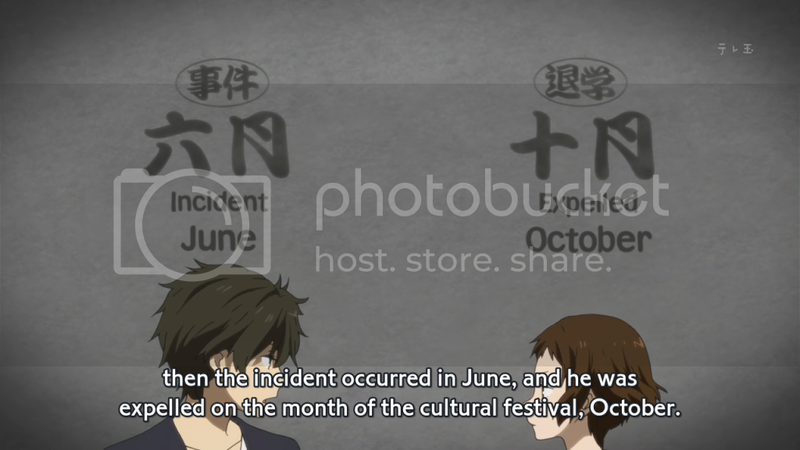 Do watch Hyouka and for two more reasons: a. the visual representations of the facts are always gorgeous and b. it has the most elegant and down to earth fanservice I’ve ever seen (ep.7). Never though about it this way. Great article! 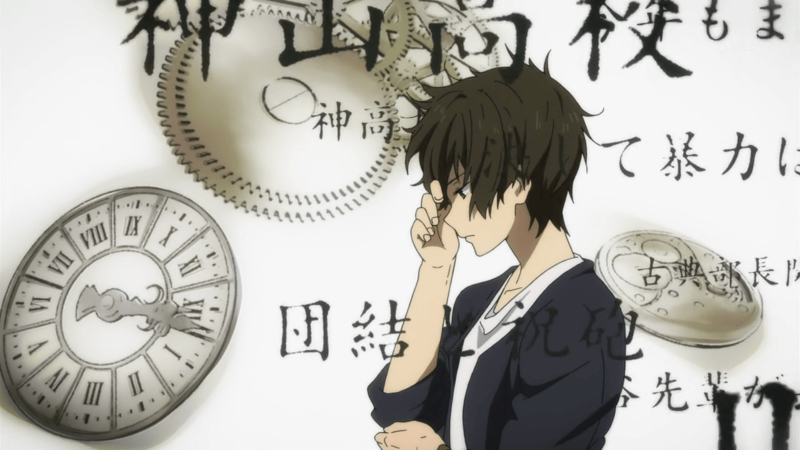 I really enjoyed reading this since Hyouka is such a great show that really sneaked up on me this season. The graphics are one of its most commendable aspects, but I also love how detailed each “mystery” is, particularly this one. Mixing the regular mode of the show with a more personal concern of Chitanda’s amped up this arc and the levels the club rose to solving it. I was never much of a history buff either, so I was surprised at how interesting I found your overview of the Annales School of historiography. 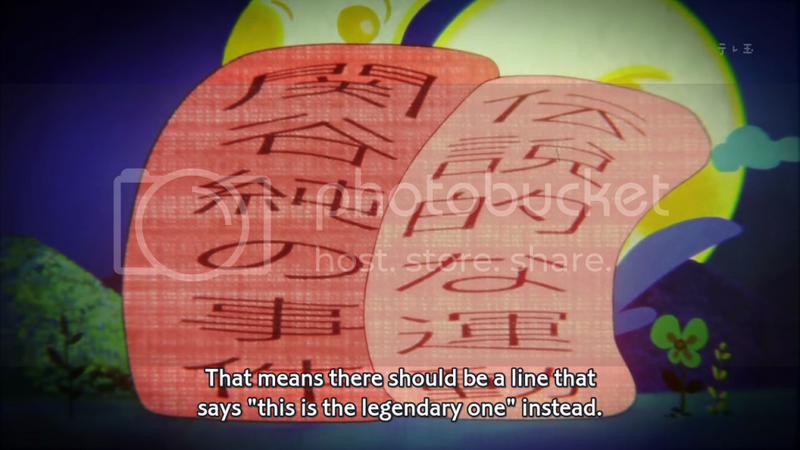 @Marina: Yes, The niece of time arc is the most interesting up to now. 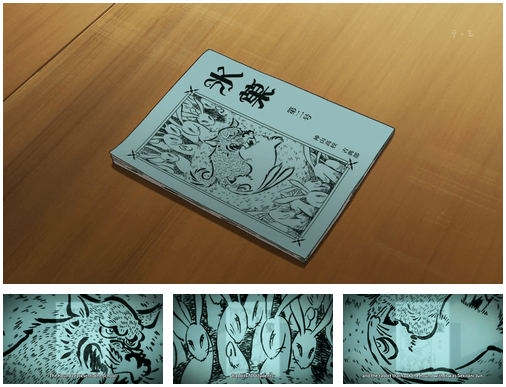 Let’s hope for something equally intriguing in the remaining 9 episodes. @The Paper: hehe. I guess fanservice can be good at the appropriate doses and can change people’s minds :P You’ll just have to bear the first episodes that might seem dull or annoying (especially Chitanda can be irritating).